CR Way to Great Glucose Control 2018 Enrollment has closed. We will now shift our focus to our community and teaching. If you would like to be notified next time the CR Way to Great Glucose Control enrollment opens, click here. 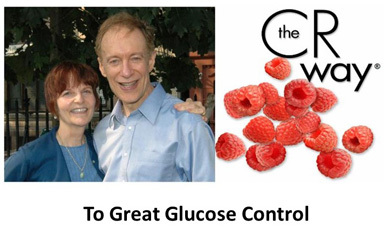 If you have prediabetes or just want to optimize your glucose management, the CR Way to Great Glucose Control course is essential consideration. Most participants gain extraordinary control over their glucose levels when they are willing to working at it. One of the most important aspects of the CR Way to achieving extraordinary health is keeping glucose levels low. The only way to know for sure if you are doing that is to use a glucometer to measure your blood glucose levels. The questions people want to know are: What glucometers are most effective? and What is their cost of use? So LivingTheCRWay gives you practical information on products that we and other members have tried. Currently, we prefer the Free Style LITE, but we continue to review and try new products.Glucose measuring systems we have tested and reviewed: If the product is not available directly from Amazon, use their sponsored links. Glucose testing can be expensive. So take advantage of the LivingTheCRWay partnership with Amazon to get the most economical ways to test blood glucose levels. On Amazon, glucose-testing suppliers bid against each other so prices are grealty reduced -- the best we have been able to find on the 'Net. Take time to read about the glucose-testing-supply companies that interest you. When you decide which to purchase, please click on the product picture to go to Amazon for purchase.This directs a small percentage of your purchase to the LivingTheCRWay, so we can contiinue to provide this service to you.Your cost is not increased. Recently, a participant in the Great Glucose Control classes asked, "If I have diabetes, how can I keep my glucose from going up when I exercise?" For a long time, there wasn't a good answer for this problem. Now we've discovered that ultraviolet light increases systemic nitric oxide, which is released when muscles contract. This action lowers circulating glucose. We are happy to discuss this: Please call 877-481-4841.